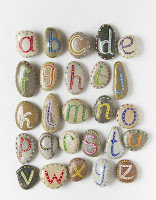 OK - so I'm still plugging away at my plethora of pebbles. Today we had a full-blown craft day dedicated to our beach treasures. To be completely honest, I think I was more excited than my kids - I had seen this fabulous rock alphabet on Pinterest, and wanted to recreate it with my own pebbles. This one was done by In The Moment - and I love it! Great job!! How do you think you'll use them? Looks great! Your daughter is correct. It DOES look like a professional made them! That is very cute! I saw that same picture on pinterest too!!! WHOA... those are adorable. Seriously adorable. You were the first teacher I found pebble ideas from, so I am inspired. I like having the new black character pebbles with the pillars written on them, too. Thanks, everyone! I'm going to let my children play with this set for now (perfect for my two youngest). 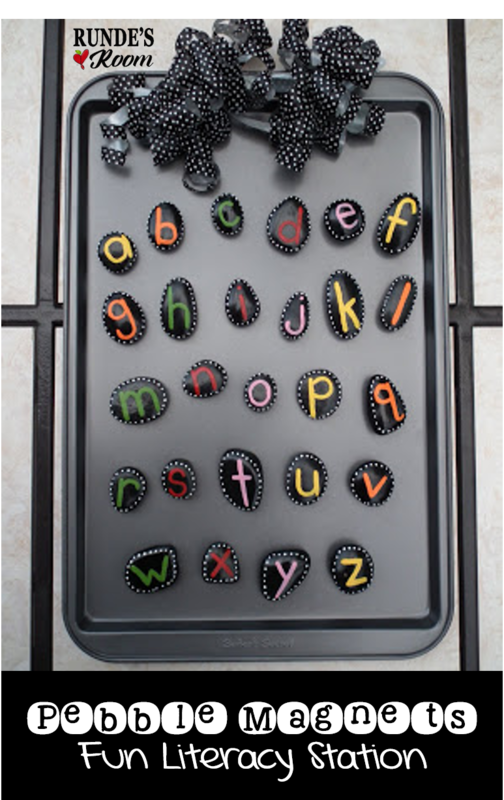 I may give in to my daughter and make one for her kindergarten teacher - a back-to-school present. 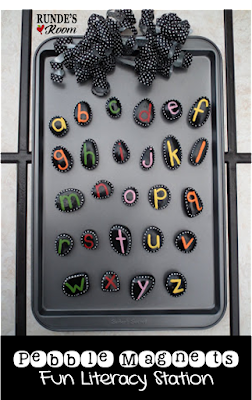 My students are a little too old for word building on a cookie sheet - but they love my magnetic poetry kits, so I may incorporate these somehow - maybe for titles?? I also think they would look fabulous at the top of my smaller bulletin boards. Wow!! These are amazing! Yours turned out so great!!! I love pinterest-inspired projects. Very nice...will you use it in your classroom? YAY - so, so, SO proud of you. These are WAY cool. I'd made some letter puddles for my office but when I went back up there, they'd ALL fallen down. Should have fired up that glue gun instead of just trusting the adhesive on the magnet. Thanks for the suggestions!!! Love it...want a set too! I saw those too. I love them. Okay, I just may have to try them now. I also pinned the same abc stones! Yours turned out so nice! You totally inspired me to create some literacy centers with your idea. ADORABLE! As soon as I read about how you used toothpicks to apply the small dots, I thought about some of the nail polish my daughter has. It is for making those tiny lines and designs on top of the base color so the brush is very skinny. I believe she even found some at Dollar Tree in some bright colors...it may be worth a try for all those tiny polka dots. Thanks for sharing! Totally perfect for my son's kindergarten teacher...Do you think a 3rd grade teacher would use it? I could see a 3rd grade teacher using it for a center activity. They would probably need two sets of letters to make a building words, or spelling center. I plan to use the letters as a border for one of my smaller black boards. These are wonderful! I've been looking for a way to make spelling practice more fun. I think I'll do this project with my kids. Thanks for the great idea! We LOVED these and featured them at our blog, Preschool Lesson Plans! We were sure to give photo credit/a link to your blog, but we'd love for you to take a look at the feature.